This is great addition Howard. I well remember the “cowboy era” and even had a Roy Rogers outfit as a kid and collected Roy Rogers’ comic books. 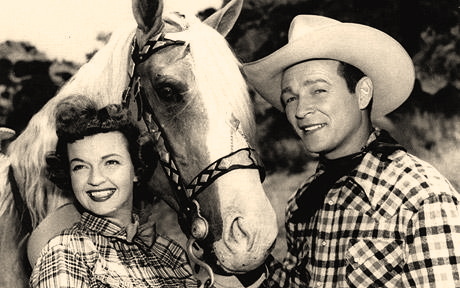 I also remember Gene Autry coming to Halifax with his horse Champion. It was a treat to see them, but I would have preferred Roy, Dale and Trigger. We just discovered the blog, Howard, and it brings back memories of the Halifax days, your gigs with Symphony Nova Scotia and of course your singing/dancing/acting summer school with Alan Lund. We often wonder if any of those graduates went on to do good things in show business. Are you sure you’ll post that picture as soon as you find it? Or are you only tantalizing us with the possibilities? Inquiring minds need to know…! Loved this article Howard, brought back a lot of good memories. I loved watching their TV show & yes I remember Dale being very religious. Now I will be humming Happy Trails for the rest of the day! HI John: Thanks for your comments. Just so you know, I will be doing a post on Gene Autry soon. It is so good to hear from you. I have great memories of the school. I imagine some of the students did go on to do memorable things — they certainly had the talent ! Please keep in touch. My daughters actually brought me two pictures last night at the concert. I’ll collect a few more and then I promise to post them. Happy trails to you, Rose. Hope things in Stratford are going well. Thank you so much for the photos. And for setting me straight on the Dale Evans autograph. I will post them soon. Wonderful memories. I always watched Roy and Dale in the 50s. it must have been great meeting and working with them. When I was a teenager, I worked at the Grandstand as an usher, so was able to see all of the shows many times. I do remember Roy Rogers before show time riding a motorcycle quite fast around the race track that surrounded the stage. I also have a signed autograph from Dale Evans with a scripture reference. Does anyone know of a film clip of the Rhapsody in Blue performance? Great article. I remember watching that show through a hole in the fence. I spent a few hours with Roy at his museum in Victorville, CA in the early 90s. Great guy!